Unlike the cookie-cutter selection available from pre-built or semi-custom cabinet dealers, we work with you and your design professional to craft cabinetry to your specifications. 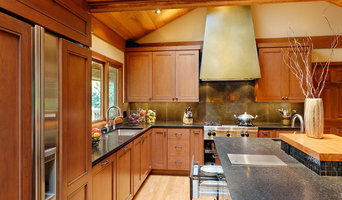 Kitsap County Cabinetry Showroom Best of Houzz Winner! Creekside Cabinet & Design is a locally owned business. For more than 15 years we have been providing exceptional value to our customers on the Kitsap Peninsula and the Puget Sound. 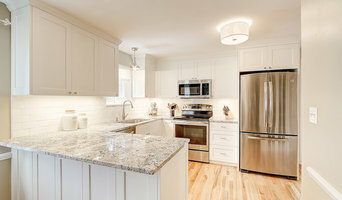 Connie Moon Design LLC offers Seattle area customers a comprehensive selection of affordable quality cabinetry and countertops, tile, sinks and hardware selections. Beech Tree Woodworks is a unique, sustainable woodworking company creating high-quality, hand-crafted, custom cabinets, kitchen cabinets, built-ins, and fine furniture. We work closely with our clients and our clients’ designers from Seattle to Olympia and across the Puget Sound region. With every custom cabinet project we do, our goal is to create a look specific to our clients’ needs, tastes and desires. From bathroom cabinets to kitchen cabinets and across the whole home, our mission is to create long-lasting green cabinets, furniture and built-ins that will be passed down for generations. De has been designing beautiful, functioning, inviting interiors for two decades for clients who want their home to fit their life style, as individuals but within a family. TheRTAStore.com sells ready to assemble and pre-assembled kitchen cabinets and bathroom vanities. We have the absolute best customer service in the industry! Since 1978, our team of skilled and accredited designers has been helping homeowners create the kitchens of their dreams. Our showroom has cabinetry, countertops and options to fit every budget! Our goal at is to ensure each of our client’s projects, from inception to completion, is delivered with unmatched design services, the highest quality cabinet products & rigorous project management. Connie Wyland, Allied Member ASID, owner of Wyland Interior Design Center located in Poulsbo WA. Connie has over 28 years of experience in both residential and commercial design. Her talents have brought her to specializing in Luxury Kitchens and Baths, Custom Homes and Remodels and all commercial projects. As an interior designer, she thinks outside of the box and can look past those four walls. Her architectural knowledge and experience in knowing what walls are structural, or when you are able to move plumbing or electrical, lets her visualize your project’s unlimited possibilities. What sets Connie Wyland apart from other interior designers and kitchen/ bath designers? ...... Her creative signature is to come up with innovative design elements and touches to make each design uniquely different for each of her client's projects. Take a closer look at each of her project photos to see if you can recognize any of them. Connie Wyland doesn't have a favorite style or color, she can design anything her client wants. A good interior designer will listen to her clients and design around their tastes and lifestyles. Wyland Interior Design Center is a "One-Stop- Showroom and is the authorized DeWil's Custom Cabinetry, Showplace Wood Products- Fine Cabinetry and Hertco Cabinet Dealer, as well as all flooring products, counter tops, window blinds, fabrics, wallcoverings, furniture and more. Connie Wyland was a Board Board Member for * City of Poulsbo's Design Review Board, 1999-2002. * Historical Downtown Poulsbo Assocation, 1999-2000. Savvy Cabinetry by Design specializes in kitchen and bath space utilization with a balanced approach. We are at your service, with personalized design and expert project management. Nancy offers innovative design solutions to enrich lives by creating spaces that inspire, entertain, and function brilliantly with a broad range of planning, selection and coordination services. We design, build, and install custom cabinetry in any room of a home and/or business. Our high quality craftsmanship and attention to detail is reflected in a wide range of cabinet styles from the classic mission to the high gloss contemporary. Seattle's Premier European Cabinet Maker | Best of Houzz Winner! We are a small custom cabinet shop in North Seattle focusing on quality materials and real craftsmanship. All our cabinets are custom built here in our shop. Seattle premier custom cabinet shop with European influence and design. We focus on quality materials and real craftsmanship in building our cabinets and have been realizing homeowners dreams since 1947. We can match any style cabinet in almost any material. Come see our showroom for selections on styles, materials and finishes. Cabinetworks focuses on quality and local workmanship by making all our own cabinets here in our shop. We try to hold a high industry standard using only the best materials we can get our hands on. Every cabinet is built custom at a reasonable market rate to fit your home and maximize space usage. We can match almost any door style in any available species of wood and fit them in any style of cabinet. Please refer to our projects page for past projects and styles of cabinets. 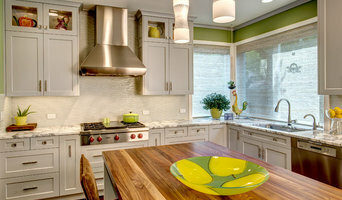 Seattle Premier Custom Cabinetry & Design - 3 x Best of Houzz Winner! Jesse Bay Cabinet Co. is a full design/build cabinet and millwork company specializing in custom cabinetry and millwork for residential and commercial applications. With over 25 years of experience, Kaci Woodworks, LLC is your one stop cabinetry installation, re-facing, furniture, built-ins and custom cabinet shop. From start to finish we do it all. At Kaci Woodworks, LLC, we believe in high quality craftsmanship, attention to detail and excellent customer care. 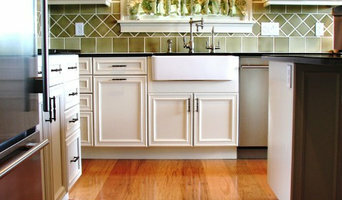 For quality that you can depend on, call Kaci Woodworks, LLC today and get your cabinets done the right way! We work hard to establish & maintain one-to-one relationships with customers while offering expert advice to help homeowners & professional contractors finish their projects on time & on budget. We can help you determine the best use of your existing space, consult on decisions you’ve already made or provide compelling and unique design ideas that fit within your budget. DB Indy Is a growing group of seasoned and experienced Kitchen & Bath Design Professionals with the mutual desire to drive a better finished product at a better price in any project and at any budget.